I have already talked a bit about why I wish Banshee weren’t dead in the current Marvel Universe, but I just reread a lot of Classic X-Men stories and I’m sad and nostalgic all over again. I also keep coming across awesome art of the dearly departed Sean Cassidy and decided he deserved a second post. Besides, I know I am not the only one who misses the X-Men’s most stalwart Irish member! Comic Book Resources has a yearly event in which readers vote for their favorites and Banshee made it to number 28 this year. Brian Cronin has written a hilarious bio for Banshee that is full of facts and half-truths (you may have to compare and contrast his Wikipedia entry to discover the differences). Gil Kane and Joe Sinnott drew the above cover to X-Men #76 and although it is not Banshee’s first appearance, it is a great issue. Banshee was created by writer Roy Thomas and artist Werner Roth, and first appeared in X-Men #28 (January 1967). Banshee is on full assault here in this piece by Roger Robinson. Chris Bachalo drew Generation X, which he co-created with Scott Lobdell, for much of the series first three years. Banshee shared headmaster duties with Emma Frost (who had made good after years of being a bad, bad girl). I am a big fan of Bachalo’s Banshee due to his interpretation of his classic costume mixed with the Generation X uniforms. J.J. Kirby’s lighthearted rendition of Banshee depicts him crooning into a microphone which is consistent with the character’s past. It is in the Grand Ol’ Opry that Professor X asks Banshee to join the All-New, All-Different X-Men. A classic pose of Banshee, drawn by Dave Cockrum and inked by Joe Rubinstein, for the Official Handbook of the Marvel Universe. Banshee without his pipe is like James Bond without his martinis, in my humble opinion. It just fits the character. Banshee takes on Magneto all by his lonesome in X-Men #104 (drawn by Dave Cockrum). Even against impossible odds, he shows he’s got the courage to be an awesome hero. This teaser showed up this week on Comic Book Resources’ Marvel T&A: The Event Debate. It appears to be part of the new Chaos War event spanning out of several Marvel titles. Banshee showed up not too long ago as a resurrected shade of himself thanks to Selene’s Necrosha event but he was hardly more than a techno-organic zombie. If he, Thunderbird, the Stepford Cuckoos and duplicates of Madrox the Multiple Man are going to appear again as the resurrected dead, there’s a chance they might be around to stay. Banshee’s never been on a “Dream X-Men Lineup” list to my knowledge, but I still love him. He got the short end of the stick when it came to Claremont’s X-Men run, at least until the very tail end of it, in the wake of the “Siege Perilous” storyline. I feel Generation X reinvigorated him, and gave him the most interesting possible partner in the form of Emma Frost. Him being able to sing makes sense…vocal chords like his almost demand it, and his daughter Siryn has the power to hypnotize and suggest things to people with her voice (as the name implies). I always wanted Banshee to be able to do that for some reason…possibly because it seems like the “mind control voice” is usually a female thing and I’d like to see a male character have it for a change. I hope he comes back for good, too. I really like your “site”, I just wanted to say that apparently they now brought the amazing Sean Cassidy back to life. Hey Rishi! Thanks for commenting! 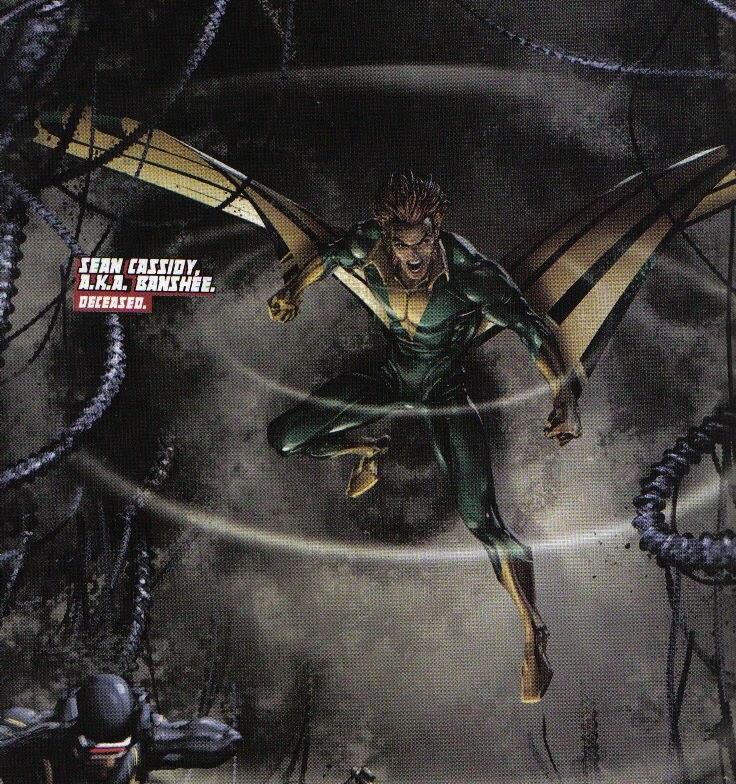 Re: Sean Cassidy, I think he came back for a minute in Chaos War: X-Men which featured the also deceased Thunderbird and Moira MacTaggert, but the characters remained in the realm of the dead afterward. If there’s something else that has happened, please let me know!